This is my first DIY project of 2014! As I posted the above photo…I realized that I have not even shared my (mostly) finished walk in closet project and after photos. Consider this a sneak peek! 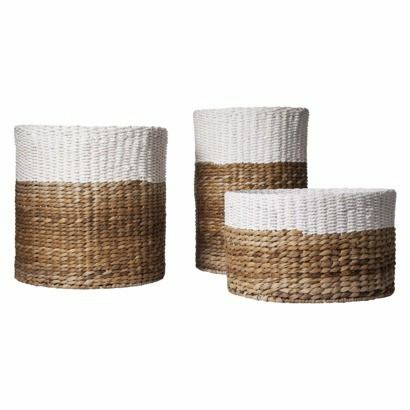 Chalk Paint can be used on almost any surface...wood, glass, fabric, leather, and woven baskets! It truly is amazing stuff. See this post for more info on all the things you can paint with Annie Sloan Chalk Paint. This was such an easy and quick project...I even did it at the kitchen table on Sunday while watching football. Go 49ers! The basket looks great and I'm loving the closet sneak peak! looks great-I tried doing this on a small box made out of the same material, and I think it just looked messy. not sure if it was the brush or the paint! and wowzers, what a closet! That looks great! What a nice update. Can't wait to see the before/after on the closet.